Rare property with views of both Lake Nacimiento and San Antonio Lake. Beautiful single level home with amazing views and low maintenance landscaping. 42 +/- acres of privacy surround the house with room for horse facilities, a shop, or a hobby vineyard. The home is approximately 3,800 sq. ft. with 4 bedrooms and 3 bathrooms. The enormous living room flows into the dining room and modern kitchen. The kitchen has nearly as good of views as the Master bedroom and Living room. 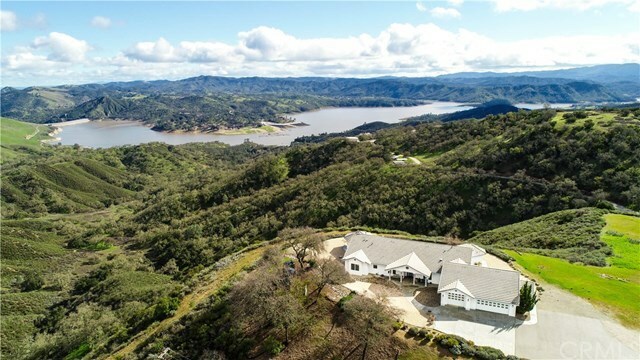 The large Master Suite has distractingly good views of Lake Nacimiento and will make you never want to leave with its own fireplace, palatial Master bathroom, and oversized walk-in closet. There is not a single stair on the property, so this is truly a single level home. The huge garage is nearly 38' x 38', giving space for up to 6 cars. Or your boat and still have room for 4 cars. This is an estate property with terrific views, and with the easy paved access and plenty of parking, is the perfect home for entertaining in a private setting. Directions: Nacimiento Lake Dr. (G14) west of Paso Robles. Continue over the dam, left on Interlake Rd. (still G14). In 1.5 miles on Interlake, the locked gate for Skylar is on your left. Subject is first left just inside gate.